Beudy Bryn Celyn01691 830030work Self-cateringMid way between Oswestry and Welshpool, set on a hillside with stunning views of Shropshire and Wales. Recently converted byre, furnished and equipped to a high standard. The accommodation has been designed with the needs of visitors with limited mobility in mind. Riding, cycling, walking nearby. Offa's Dyke Path 400yds. The accommodation comprises a large open plan living/dining/kitchen area, with bathroom off. Stairs lead up to a spacious gallery bedroom, normally laid out with a king sized double bed (or two single beds on request). The open, airy living accommodation is comfortably furnished with a mixture of new and period pieces to give a pleasing country effect and has a number of interesting features including a unique semi-circular stained glass window. 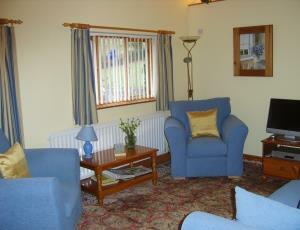 The accommodation has full gas central heating (under your control), and a TV, video and CD/radio/tape player. The kitchen is well equipped and includes a washing machine, full cooker, microwave cooker and refrigerator. There are outdoor drying facilities and also a tumble dryer and freezer in the storeroom for your exclusive use.